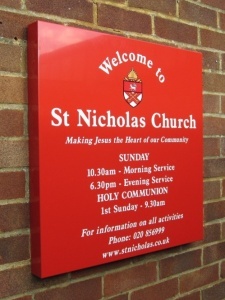 Our range of wall mounted aluminium composite box tray church signs are manufactured from high quality 3mm aluminium composite (ACM) sheets which using the latest technology can be CNC profile cut and grooved to create the box section. 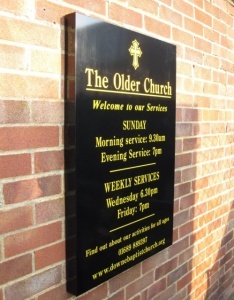 Our wall mounted box tray church signs can be vinyl laminated to one of a choice of 18 standard background colours, stylish brushed aluminium metallic effect or full colour printed graphics applied. 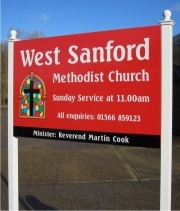 The signs are 100% waterproof and are suitable for either internal or external use where they can be fitted to any solid flat surface. 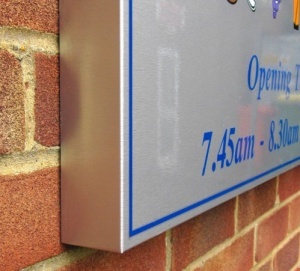 Box tray signs come complete with aluminium angle bars which are attached to the wall and the box tray sign hung and fixed securely to the aluminum section. 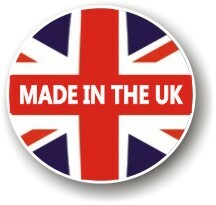 * Please Note - Our ACM box tray signs can only be cut and folded to create rectangular or square shapes. 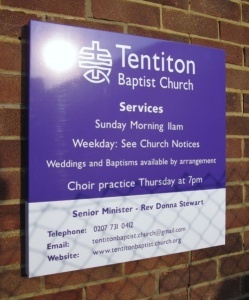 Why Use Aluminium Composite for your New Box Tray Church Signs ? 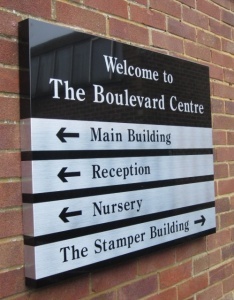 Aluminium composite (ACM) is an alternative material to aluminium that is used in the production of internal and external signage and displays. Widely used in many commercial applications ACM is formed from two thin layers of aluminium which are then bonded to form a sandwich with a low density polyethylene core. 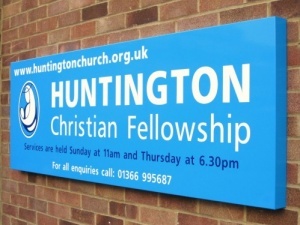 The finished sheet is lightweight yet durable and is ideal for long term wall mounted signage applications. Box tray signs are cut to a shape and then grooved to allow the flat sheet to be folded into a box section which then has reinforced corners. You can give your new wall mounted ACM church signs added protection with the addition of our Protective Face Film (PFF) PFF is a thin waterproof UV resistant clear protective laminate which is applied to your signs during the manufacture process. 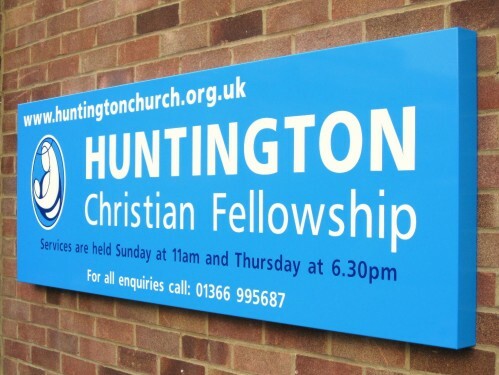 PFF helps to protect your signage against the adverse effects of the sun, damage from Spray Paints, Solvent and Water based marker pens, Airborne Salt, Sea Spray and everyday dirt and road grime. 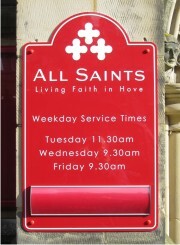 To keep your church signage looking new periodically gently clean with warm soapy water.